I am one happy camper! While hiking alone along the Pacific Crest Trail near Burney Falls (Shasta County CA) yesterday I finally managed to photograph pileated woodpeckers (Dryocopus pileatus, formerly Picus pileatus). Pileated woodpeckers are common in the Southeastern States, but infrequent, except locally, in the Great Lakes Area, the Boreal North and the Pacific Coast. I occasionally saw a pileated woodpecker when wandering in forested areas, but was never fast enough to get a picture before it disappeared – until now. Yesterday there were four, maybe five, pileated woodpeckers flying from tree to tree, hitching down trunks tail first, foraging in the duff on the ground, making their distinctive drumming sound and picking insects from tree bark. I was able to quietly sit and observe them for many minutes. Excluding the ivory-billed woodpecker, which is probably extinct even though sightings were reported in 2004/2005 in Arkansas, the pileated woodpecker is the largest woodpecker in the United States. A mostly black bird, the pileated woodpecker has a bright red crest, a white chin and a white stripe from the bill down the neck to the sides of its breast. Its long, chisel-like bill is slate black. The red of the male’s crest extends to its crown while the red crest of a female becomes mottled with black on the crown. A female pileated woodpecker has a black malar area while the malar area of a male is red. The leading edge of the underwing has extensive white and there are small white crescents at the base of the primary feathers on the upper side of the wing. Inspiration for the cartoon character “Woody Woodpecker” probably came from the pileated woodpecker. 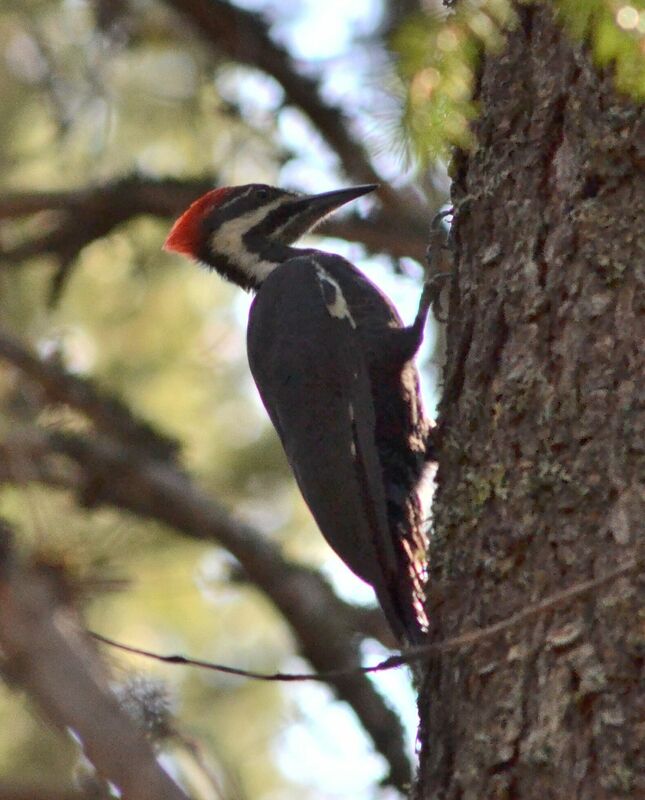 Along the Pacific Coast pileated woodpeckers are associated with dense, old-growth forest. However, they do not require old forests. Densely forested areas, regardless of age, will support pileated woodpeckers as long as there are some large older trees, snags and quantities of downed wood. Pileated woodpeckers are monogamous and remain on their territory all year. Non-migratory, occasionally they will wander slightly from their year-round range. More on pileated woodpeckers in my next post. Gallery | This entry was posted in Birds and tagged Dryocopus pileatus, nature photography, Picus pileatus, pileated woodpecker. Bookmark the permalink. I saw my first one in Florida. They are rather big. Probably the largest woodpecker in the United States.